How Well Do You Know Your Compressed Air System? Do you recognize problems before the system goes down? Learn about system management, conservation principles and preventative maintenance in a one day seminar. Thousands of people have attended and participated in this Level 1 seminar. Last year attendees in the St. Louis area collectively saved their companies more than $5.7 million by implementing the principles of this seminar. Compressed air is considered a hidden utility in industry. The largest motors in most plants are air compressors. Many people do not realize the cost of compressed air. Without proper air management, that cost is lost in the electric bill. How often is compressed air maintenance a daily routine? Compressed air equipment is mechanical, and therefore needs proper maintenance. We will work with you on setting up regular preventative maintenance schedules, avoiding costly downtime. We guarantee one-on-one interaction with industry professionals and personal attention during this one day seminar. The course is divided into two sections. 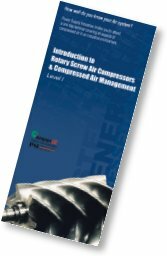 The first consists of an informal lecture where questions are encouraged; topics covered include rotary screw compressor controls, maintenance and air management. After a catered lunch, small groups are then taken into our shop for "hands-on" instruction. Every attendee has the opportunity to learn air conservation principles that will save money within their individual system. The theories and practices introduced, when applied, will provide clean, dry, stable air at a reduced energy cost.